Clarins Sunscreen Wrinkle Control Cream: Does It Really Work? Anti-aging skincare begins with prevention. Since the sun and the UV radiation it emits is a major cause of skin cell damage and the subsequent manifestation of signs of skin aging that follow, it’s never too early to start on a daily sunscreen care habit. The earlier you get into the healthy habit of putting on sunscreen, the better prospects you have in enjoying younger looking skin for longer. 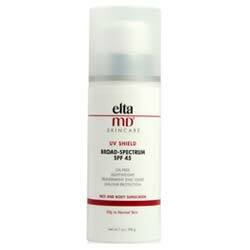 You must know by now that the best sunscreen products are the ones that give you broad spectrum protection. 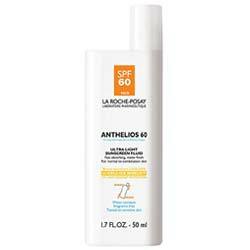 This means, your sunscreen should be able to help either block or deflect the longwave UVA rays and shortwave UVB rays. UVA rays penetrate your skin deeply where it damages your skin cells which later in your life manifest as wrinkle, sun spots and other signs of skin aging. UVB rays, on the other hand, causes sunburn. Clarins Sunscreen for Face Wrinkle Control Cream SPF 30, which retails anywhere between $30 and $40 for every 2.7 fl. oz. bottle, is formulated to give you a broad spectrum protection at high levels. It suits all skin types, and is particularly helpful in preventing sun damage among those who burn easily when exposed under the sun, as well as for those who get frequent and prolonged sun exposure. Lightweight and sheer, this non-sticky, cream-based product does not leave white streaks on your face when applied. It blends easily with skin but does not leave it greasy so it’s perfect to go under your makeup everyday. With an SPF 30 formulation, this product is able to protect your skin for up to 30 times the normal time it takes for it to burn without protection. Founded in France in 1954 by Jacques Courtin-Clarins, this brand remains to be family run despite having earned the reputation of being one of the most respected global brands in the beauty and skincare industry. Presently, Clarins’ business spans from skincare to cosmetics to perfume, targeting both women and men. How Does Clarins Sunscreen for Face Wrinkle Control Cream SPF 30 Work? Skin is protected from sun damage through the combination of four active sunscreen ingredients: Octocrylene, Octinoxate, Titanium Dioxide, and Ensulizole. 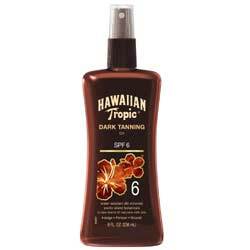 Apply product liberally on all exposed parts of your skin at least 15 minutes before going out into the sun. Re-apply every 2 hours or as often as possible, most especially when wet. Take care not to let product come into contact with your eyes. Product is poisonous when swallowed. Keep out of reach of children. 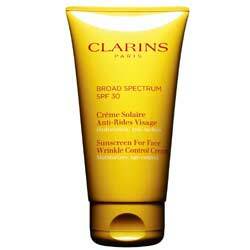 Who Can Use Clarins Sunscreen for Face Wrinkle Control Cream SPF 30? Not for use of children under 6 months of age. Clarins Sunscreen for Face Wrinkle Control Cream SPF 30 can be your ideal ‘anti-sun’ partner for life. 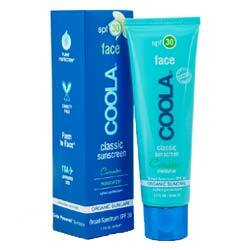 However, as is common with many other sunscreens, this product is made from potentially irritating ingredients which may or may not suit your skin type.